"GET MY ESSENTIAL GUIDE FOR PRESENTING TO PHYSICIANS!" Breakthrough To Mainstream Practice Success! "If You Are Looking For A REAL Career As An Acupuncturist In The New Model Of 21st Century Healthcare Delivery, Then You Must Learn How To Present To And Communicate With Physicians – In A ‘Language’ THEY Understand And Respect. That Is Why I Created A Guide That Gives You All The Firepower You Will Ever Need So That You Will Be The Unchallenged Expert Every Time You Speak To An MD Colleague Or Other Mainstream Professional. If you are struggling to find inclusion in the NEW medical system and fear you may be left behind in this era of healthcare reform, I have essential information you must have about how to position yourself for massive success within the mainstream - and it comes straight from a physician colleague of mine. You asked for it and I listened. If you are reading this, then you and I are a lot alike. I too looked at what was available to me in terms of work and found a serious disconnect between what I wanted and am able to do and what I was going to be allowed to do. That’s why I got busy making in-roads toward mainstream and hospital based practice. Now that I have implemented two hospital clinics and created a program to travel and teach others about what we do as acupuncturists, I feel certain that you too will find tremendous value in finding out what I learned along the way. 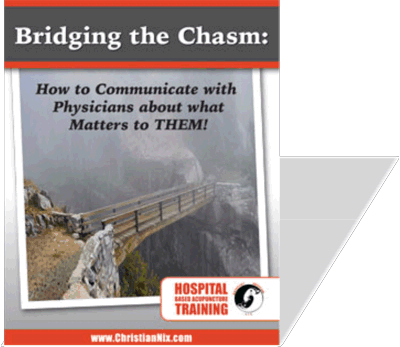 For the first time in two years, I am making available my incredible guide on BRIDGING THE CHASM: How To Talk To Physicians About What Matters To THEM! This is STILL the first and only comprehensive program on how to approach and successfully present yourself to mainstream medical professionals and administrators. Your inclusion within mainstream medicine practically guarantees your financial success and that you will find the satisfaction you so desired when you first started out in medicine. Do You Know How To Impress Doctors? You see, the biggest obstacle to your inclusion within the mainstream – which is where the prestige and money are and will stay – is NOT your clinical ability. Now, I am not saying you can afford to be a hack in-clinic – far from it. This is medicine and only the best and brightest should be doing this kind of work; so practice hard and improve constantly. But that is NOT what is holding you back. The biggest obstacle to you having the career you want is the COMMUNICATION CHASM! You cannot imagine how your career and life can change once you understand how to talk to mainstream physicians and administrators in a manner that makes sense to them and meets them where they are! You are closer than you think because what I have to teach you in this short program can change your career. It has already happened to others in our profession. Listen to what others have to say about Bridging the Chasm and their growing ability to communicate with the mainstream. What are the 7 points that most LAc’s will NEVER learn about creating the career and income they secretly want and why does 21st century practice demand that you move toward mainstream inclusion? What are the 2 Myths that hold back nearly 100% of LAc’s and how can you be sure that you are not sabotaging your own opportunity for inclusion? What is the ONE THING you must do NOW to build your career in the NEW medical system? SPECIAL BONUS SECTION from Dr. Paul Raford: an absolutely necessary primer on how to talk to physicians in a language they respect! Being familiar and conversant with the current research about acupuncture, AND the ‘diseases’ you treat – i.e. what is your leverage in mainstream medicine? How can you be sure that you have head on straight? The opportunity to prevail and even shine within the mainstream as a medical acupuncturist has never been better and the new legislation has created a situation that will not come again in our lifetime and that the medical system has waited decades to see. Yet the overwhelming majority of acupuncturists are completely ignorant of how to use the new legislation to leverage our value within mainstream medicine. In fact, many acupuncturists are so wrong-focused that they are pouring their effort into things that have no chance of prevailing and waiting for state and national associations to magically give them a great career. Bad move! Learn what most LAc’s are doing wrong and make sure you get your attitude adjusted for maximum benefit because this era of healthcare reform will not last! I can see HBA will be the mainstream. It is good to have all chronic patients or pain, stressful patients in the hospital seeing an acupuncture physician just as they all need to consult with other professional doctors...I really appreciate your practical guide. You are a genius. There is ONE single thing that you MUST do and do quickly if you hope to breakthrough to the mainstream in the next 2-5 years. No one is talking about this and NO ONE is teaching about it . . . until now. If you don’t know what you need to do and how to do it . . . why would you expect anything different than a totally mediocre career? I have done the work for you to get clear and to get busy with real focus. So be glad that you have found this page and read on to see what you get in Bridging the Chasm. Whether you choose to go mainstream or not . . .You don’t have the option not to address these issues! Have you clarified your own thinking about the logic of holism and do you really understand holistic pathophysiology? If not doctors will know it and no school clarifies this for you so it is your task to figure this out. If 96% of LAC’s and 100% of MD’s agree in a 2007 study that communication skills are the biggest single issue and obstacle preventing high-level inclusion, then what is your excuse for not learning this? *No one anywhere is teaching this! What are the two aspects of presenting to physicians (or any audience) about acupuncture and professional-quality holistic medicine that can give you confidence and competence immediately? What is the epidemiology of the 21st century patient population that gives you massive leverage within the mainstream? *If you know this, you can practically write your own ticket. What are the similarities between the holistic and biomedical understandings of pain, stress, anxiety and depression? Learning how to talk about the epidemiology of the 21st century patient population and acupuncture’s effects on brain chemistry is the highest value training to can get to fast-track you career during 21st century healthcare reform. Acupuncturists need to work on their communication. You have always preached this. As I have dropped more and more of my Chinese terminology and just speak in regular-talk to my patients, they really seem to understand much better what is going on.In addition, being able to clearly articulate what is going on in English (not Chinese med lingo) the more I understand the medicine. I think this has to do with the inherent Western medicine background we ALL have. I am more comfortable with this and my patients are more comfortable with this. This is truly where we have to go to gain integration"
Don’t be clueless! Learn the lingo physicians respect! This is the ABC’s of your interaction with physicians. Almost all of them ask exactly these 7 things and if you know how to answer in a way that is not only relevant by compelling, you are well on your way to making an impact and being invited to offer your services. What Is The Latest From The NIH On Acupuncture And How Can You Talk About It? How do you create and cultivate serious authority status so you can leverage this position to create the career and income you desire? *What are the practical and time-tested steps you can take to make great income and to get people to pay you for who you are versus what you do? What is the TRUTH about your credentials in the marketplace and what is the most damaging and most prevalent mistake you see nearly ALL practitioners making that NEVER results in a successful career unless you know how to leverage your authority position? What are the simple strategies and tactics for pitching a hospital or physician-group practice that I have used multiple times to get my way by adding value to mainstream settings? How can you control the pitch process from start to close? What are the 2 myths you must overcome if you hope to enjoy any success in the long term and why is it in your best interest to make yourself aware of these disempowering beliefs? What is the ONE THING that practically guarantees your success in the mainstream during this incredible historical opportunity? You might be thinking ... "Can I Really Do This?" You must understand that the reason why it is so simple to get into the mainstream right now is because EVERYONE is wondering whether they can cut it. The very fact that so few LAc’s are looking in this direction and the fact that almost no one has really investigated what it takes to be of supreme value to physicians and mainstream medical settings is precisely why you have a great shot right no. THERE IS NO COMPETITION! Won’t all positions in the mainstream be taken by MD’s? The AMA physicians to learn and practice acupuncture as we all know. No point worrying about this. There are 300 million people in the US alone and stress, pain, anxiety and depression are the biggest co-morbidities in all of medicine – THE EXACT THINGS THAT WE TREAT BEST! Physicians don’t want to do it. They might think it is a cool thing to learn but very few physicians will end up costing you business. On the contrary, they want to offer it but will hire out to you – IF you know what is important to THEM! Dr. Raford read 2000+ research studies - some less than three months old from the NIH - to bring you this special insert. This is the tightest and most concise summation you can find on this topic. How can you get invited to offer a Grand Rounds at your local hospital so that you get major authority status and open an ongoing dialogue with physicians so they come to trust you and defer to your expertise? What are the essential phrases you should employ when you communicate with physicians that GRAB THEIR ATTENTION and compel them to find out more? How can you speak intelligently about acupuncture’s biomedical effects, brain chemistry and the neuronal networks that sets you apart from other LAC’s and gives you massive clout in the eyes of mainstream physicians? *You cannot get this information anywhere else! How can you take the issue and question of acupuncture as placebo and turn the tables by using this objection as a means to educate physicians about research literature and how can you use this topic to ‘win’ physicians over to your cause for all time?! What are the six neuronal networks affected by medical acupuncture and how can you speak intelligently in a way that impresses physicians about your due-diligence? How do you create and cultivate serious authority status so you can leverage this position to create the career and income you desire? *What are the practical and time-tested steps you can take to make great income and to get people to pay you for who you are versus what you do? You could actually take this short guide and create your own career as an expert - authority, presenting to physicians and mainstream administrators about the fascinating topic of medical acupuncture that more and more of them are seeking to incorporate into their existing services! I did the work, so you don’t have to! What is it worth to you to be able to set yourself apart from the rest of the practitioners in your area and specialty? If you know how to impress and confidently communicate with physicians, then you are automatically in the top-tier of medical acupuncture professionals in North America. No one anywhere denies that the biggest obstacle to inclusion is communication. Here you have my best stuff from over 14 years of effort and struggle. This short guide can dramatically SHORTEN YOUR LEARNING CURVE and set you on a path to mainstream success and major career satisfaction. YES Christian, send me Bridging the Chasm for just $97 as an instant download so I can get started on my journey into mainstream medicine and so I can save years of costly effort and struggle by learning what works from people who have already achieved success in hospitals and mainstream settings. I want to know how to speak to physicians and mainstream administrations about what matters to THEM and avoid the obscurity of mediocre private practice. I’m ready and committed to making an impact at the highest level! CLICK BELOW To Get Started . . . If you don’t agree that Bridging The Chasm is worth what you paid, I don’t want your money. Simply say so within 30 days of receipt of your materials and I will refund your purchase price.